The public is invited to a Flag-Burning Ceremony followed by a cookout, sponsored by the AMVETS Emmet Burke Post #46 on Thursday, June 14, 2007 – 5:00 PM at the home of Doug Hartle (across from Bob & Sue Welke's home). This is an official ceremony approved by the United States Government and is very impressive for those who have never seen it. Hamburgers and hot dogs will be served. Please bring a dish to pass. This week's winner of the Beaver Island Trivia will receive a three months summer subscription to Beaver Island News on the 'Net for the person of their choice. Send your guess to medic5740@gmail.com. Besides marring the countryside in the area of Bonner's Bluff, the fire (that called the Beaver Island Fire Department (BIFD) away from the business of servicing the tourist population) marred the weekend plans of many of this Island's volunteer firemen. 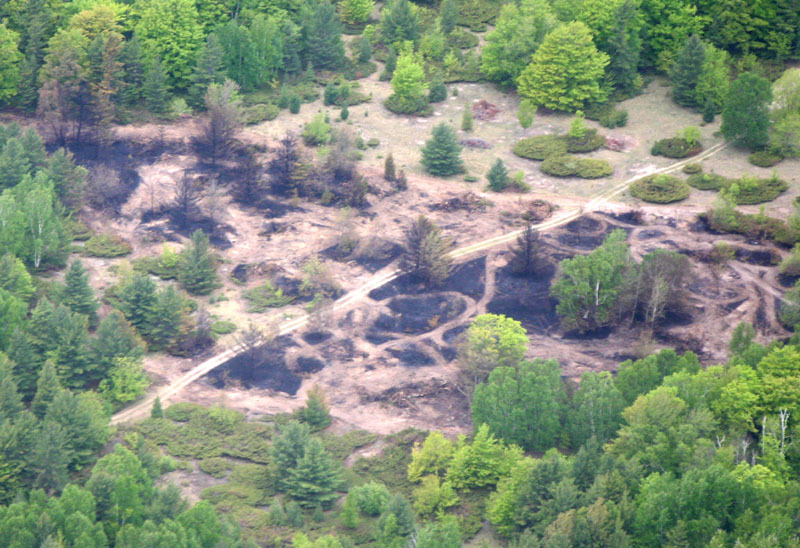 On the afternoon of May 26, 2007, the BIFD was paged to a "grass fire" which became a fire in the "junipers" and eventually a "fire in the pines." There was quite a response from the community besides the volunteer fire department. Paul Welke from Island Airways was requested by Lt. John Works, Jr. (from the fire scene though Central Dispatch) to go up in the air and check the direction of the fire and find any necessary evacuations. 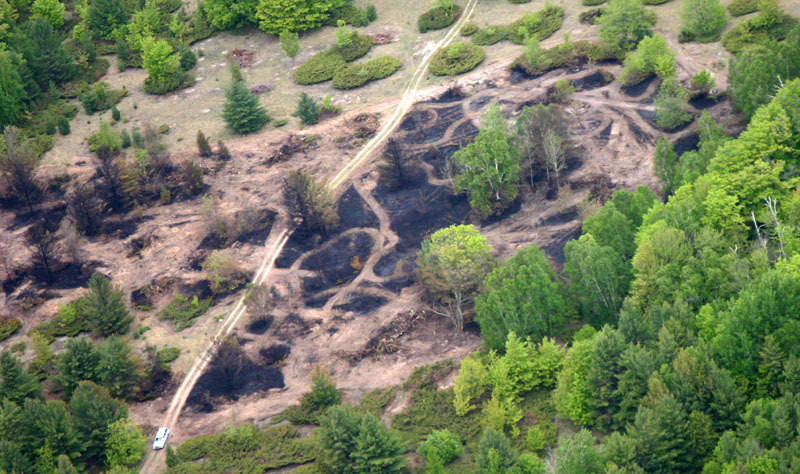 Paul reported from the air that the fire was pretty much confined to the pine trees and told the direction the fire was headed, so that the ground equipment, bulldozers and loaders, provided by many Island contractors, could be moved to the needed area for creation of fire breaks. Paul had a handheld radio with which to communicate with the on-the-ground firefighters and fire command. There were over fifty people at the site on the ground willing to help out, but the heavy equipment was the most needed equipment according to radio traffic. Several people arrived with shovels from Central Michigan Biological Station. Beaver Island EMS staged its ambulance at the Beaver Island Township Airport with EMS paged to standby there. BIEMS Director Sarah McCafferty helped keep track of the people who went in and out of the fire scene area while Jake Wasliewski, Charlevoix County Sheriff's Department Deputy, directed traffic and limited the entrance to the fire scene. 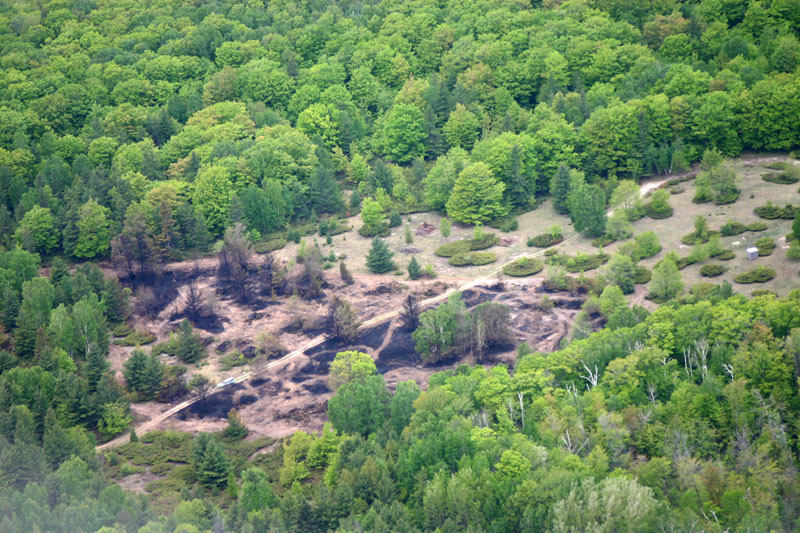 On a trip down to the Bonner's area on Sunday, May 27, 2007, there was no easy location of the fire site. Several vehicles were looking for the site and in the hour spent down there, none of these vehicles had located the site. You needed to have inside information to find it. The following pictures, taken from the air with an extended cab pickup seen in them, would estimate the fire area to be approximately eight to ten acres. Tim McDonough verified that the fire was "from 10-15 acres." This was definitely a disaster averted by a coordinated effort. Tim McDonough would like to thank Dave Schwartzfisher, Richie Gillespie, and Nathan Martin for the dozer work, Darrell Butler for the township loader work, and Doug Tilly for the brush hog work. Lt. John Works, Jr. gave an "at-a-boy all around" on the radio for all responders. When asked about how the fire started Tim said that there were two twelve-year-old boys out exploring and being eaten up by mosquitos. They thought that, if they lit a fire, that the smoke would help keep the mosquitos away. Even in what they considered a protected area, the fire took off and quickly got away from them. One kept trying to put it out. The other one ran for help so that 911 could be activated and the fire department could be on its way. "These boys could have just let it burn and told no one," Tim McDonough said. "We're lucky they were responsible enough to get some help." The fire was on private land and did not present any danger to any homes. In one of the pictures, you can make out what appears to be a deer hunting blind.